Autofil® Vacuum Filter systems are available as a complete system, or you can order components that work as individual bottle-top filters. Both options have an upper filter funnel with a dust cap that contains a 0.22μm (sterilizing grade) or 0.45μm (clarification grade) asymmetric PES membrane filter. Our membrane is low protein binding and surfactant-free. The complete system includes a Foxx Life Sciences' patented SECUREgrasp™ bottle and cap. Additional SECUREgrasp™ bottles are available as accessories. 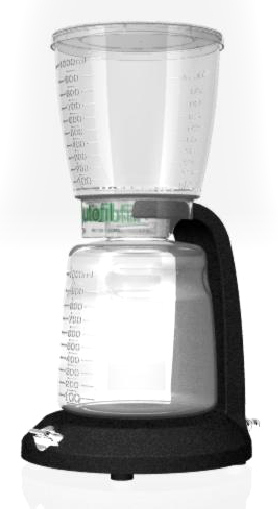 The Autofil® bottle-top filter is also designed to attach to a user supplied, sterile, vacuum-safe receiver bottle for filtrate storage. The Autofil® system is designed for sterilization or clarification of aqueous laboratory fluids. A stable, low-profile pedestal base or a low cost ring-stand cradle is available. Each Autofil® holder provides a stationary vacuum hose connection that makes set-up and use quick and efficient while preventing spills and tissue culture hood contamination. These holders also allow for hands-free operation of the filter unit. After removing the filter devices from their packaging, the operator places the unit onto the cradle engaging the vacuum port, removes the dust cover, and pours liquid into the secured filter funnel. No holding of the base during operation is required. Both cradle options have an integrated vacuum on/off switch. Foxx Life Sciences' Autofil® is the next generation of laboratory filtration devices.